Well I can’t deny that hydration is the key to healthy glowing skin. Indeed hydration is important because if our skin is well hydrated its can helps to maintain our skin elasticity and combat the appearance of those dreaded wrinkles. Recently we attended Neogence Hyaluronic Acid Hydrating Series from Taiwan workshop. During the workshop we also learnt about Neogence Hydrating 3 steps and DIY our own sheet mask session was so fun. 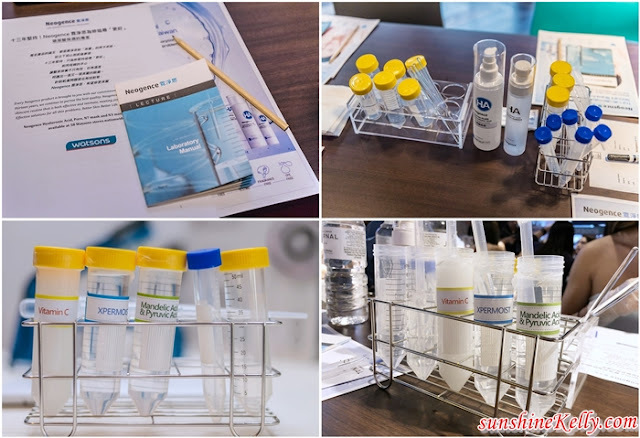 Neogence is one of the top derma skincare brand in Taiwan and their first first product "Hyaluronic Acid Hydrating Essence" was made for family. The "Essence" has become the hero product in campus and it turned out to be an instant hot hit and well-known household name. Then, Neogence was founded in 2005 and achieved so many awards since then. Neogence put a great deal of effort in research and development of their products because they insist the spirit from day one that all their products are made for their families. All Neogence products are free from heavy metal, paraben, alcohol, fragrance, dye and also no animal testing. Neogence emphasis on its 3 Steps Hydrating which is hydrating, water retention and water locking which can stimulate our skin’s natural hydration shield. The first steps is Hydrating using Hyaluronic Acid Hydrating Lotion. It is infused with hyaluronic acid and Tomore for optimal moisturizing. So immediately after cleansing we have to replenish our skin with Hyaluronic Acid Hydrating Lotion it helps our skin to maintain proper hydration level for ideal nourishing. Hyaluronic Acid Hydrating Lotion texture is clear liquid that can absorb into our skin very fast and it does not contains any fragrance. You can pour it on your palm or on cotton pad and apply on the whole face and neck with upward motion. I personally prefer to pour to my palm and then gentle tap it all over the face and neck. Then give a gentle dab or massage to enhance the penetration. It can be used day and night or as and when you feel that your skin is dehydrated. Its lightweight yet moisturizing and the gentle lotion helps to soothe the skin and boost absorption. The 2nd steps is Water Retention using Hyaluronic Acid Hydrating Essence. This is a pure, high concentrated hyaluronic acid complex offers comprehensive moisture retention. The texture is clear gel type that melts on the skin and absorb so fast leaving a velvety smooth and silky after application. I love this Hyaluronic Acid Hydrating Essence because of its high concentrated ingredients, comfort and effectiveness. My skin is very comfortable after I apply this essence and love the texture as well. Plus it can be used with other products to enhance hydration and absorption. The 3rd Step is water locking to repairs sebum, seal the water into the skin, prevent evaporation and improves skin ability to absorb oil ingredients. Hydrating Fluid with Hyaluronic Acid is a lotion like texture in off white that can be used for day and night. Just pump 1 ½ drop for the face and neck. This is a moisturizing solution to repair and enhance the skin plus retain skin balance Hydrating Fluid with Hyaluronic Acid also contains 3 key ingredients such as ceralipid, squalane and virgin olive oil extract. The product texture is soft and lightweight that can easily penetrate into skin. It just absorb into our skin and does not cause any oiliness or stickiness. Neogence Hyaluronic Acid Hydrating Series is suitable for all skin types and also sensitive skin users because this series is very gentle and moisturizing. If we can maintain these 3 Hydrating Steps diligently, we can have a healthy skin. Here comes the fun part! We got to DIY our own facial sheet mask, following the demo or Laboratory Manual given. It’s quite therapeutic as we concentrate getting the correct proportion of the ingredients and mixed them. Yeah! I got mine all done in about 20 minutes because I keep stopping to take photos and videos. Guess what??? The best part was at the end of the workshop we all graduated in Sheet Mask Program with a Certificate, hahaha! So now I can DIY my own sheet mask. Availability: Neogence Hyaluronic Acid Hydrating Series is now available at all Watsons pharmacies. Hyaluronic Acid ni makin hot ya sekarang. Good la Malaysia also dah keep up dengan produk antarabangsa.